The McMullin Area GSA Board successfully passed a Proposition 218 Election to adopt a $19/acre property-related fee in accordance with Water Code section 10730(c). The Public Hearing was held on June 6, 2018 in Kerman, CA. Two valid protests were submitted to the GSA in opposition to the proposed fee that will be levied on landowners within the GSA. A majority protest was needed for the Election to fail. The $19 per acre fee will fund GSA administration and activities related to planning and implementing local projects aimed at achieving State mandated sustainability. The Board set the rate at $19/acre for the fiscal year 2018-19. The fee will be levied on all landowners within the boundaries of the McMullin Area GSA, excluding parcels of 2 acres or less. To determine if your property lies within the McMullin Area GSA, you can use this CA DWR map tool. Type your address into the search bar at the top of the page to find your GSA. An unfunded California law, the Sustainable Groundwater Management Act requires better management and balance of groundwater supplies in a groundwater subbasin through the creation of local Groundwater Sustainability Agencies (GSAs) with extensive powers to manage groundwater. A fee is necessary to cover the costs to follow the new State law within its stipulated deadlines. Based on the Agency’s needs, the McMullin Area GSA Board of Directors is conducted and successfully passed a Proposition 218 Election for landowner approval to levy a fee. 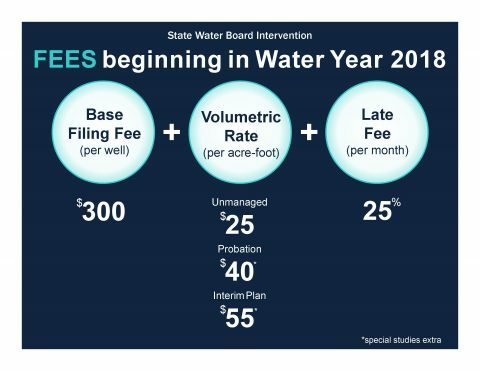 The fee will generate sufficient revenue to fund annual Agency operational costs and expenses associated with the development and initial implementation of a Groundwater Sustainability Plan. The $19/acre assessment will be levied on all landowners within the boundaries of the McMullin Area GSA, excluding parcels of 2 acres or less, via Fresno County tax rolls starting fiscal year 2018-19. Compliance with the State law is not optional. SGMA stipulates that local GSA’s must develop a Groundwater Sustainability Plan by January 31st 2020; failure to do so will trigger State Intervention. Funding the development and implementation of a GSP through the proposed fee is crucial to achieving compliance at the local level. The McMullin Area GSA Board is dedicated to navigating SGMA together as a local community of stakeholders. Implementing SGMA at the local level allows stakeholder input and provides for solutions that carry benefits to our region. 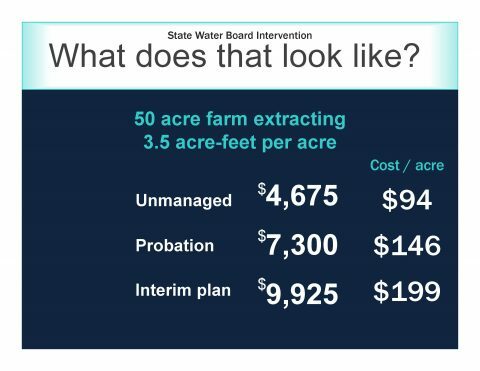 In the case of State Intervention, the California State Water Resources Control Board (SWRCB) would impose a fee structure on groundwater pumpers many times more costly than what is proposed by the McMullin Area Groundwater Sustainability Agency, and is likely to impose unfavorable restrictions without providing local benefits. The cost of State Intervention far exceeds the cost of local implementation, and without carrying the same benefits for the local community. The McMullin Area GSA Board is committed to retaining local control over SGMA implementation, where landowner dollars are utilized most efficiently and beneficially. To fund these efforts the Board conducted a Proposition 218 majority protest election for approval to levy property-related water service fees on landowners within its jurisdiction. Proposition 218 is a Constitutional Initiative approved by the voters of California in November 1996. It requires new or increased fees and assessments be approved by affected landowners. The affected landowners includes all parcel owners within the boundaries of the McMullin Area GSA, excluding parcels of 2 acres or less. The proposed $19/acre fee has a lifetime of 5 years, at the end of which the GSA will need to hold another Proposition 218 election for additional funding needs. At the March 7, 2018 Board meeting, the Directors of the McMullin Area Groundwater Sustainability Agency approved hiring a rate consultant to analyze and calculate a fee to cover the costs associated with developing and implementing a Groundwater Sustainability Plan and ongoing agency management. The fee is a property-related water service charge governed by Proposition 218. Proposition 218 requires fees be based on the reasonable cost of providing service, in this case the cost of the McMullin Area GSA’s 5-year annual budget (click link below to view). Fees must proportionally recover costs from ratepayers and were calculated on a per acre basis. The rate study prepared by Lechowicz + Tseng Municipal Consultants was adopted at the April 11, 2018 Special Board Meeting. The study includes two options for the McMullin Area GSA’s annual fee calculation. Option 1 set the fee at a maximum of $18.95/acre and Option 2 set the fee at a maximum of $19/acre. Option 2 excludes all parcels of 2 acres or less within the McMullin Area GSA. Option 2 was selected by the Board of Directors and as such, parcels of 2 acres or less are excluded from the Proposition 218 majority protest process. The Agency has landowner approval via Proposition 218 Election to adopt a fee up to the maximum amount shown in the table below, specifically $19/acre per year for parcels greater than 2 acres in size. The 5-year budget totals are shown in the graphic below (click to enlarge). Note that the fee amount levied by the Agency will not exceed the maximum amount unless an increase is approved through a subsequent Proposition 218 proceeding. The necessary funding for the Agency will be reviewed annually by the Board and, depending on the funds projected to be needed for the year, may be approved up to the maximum $19/acre. 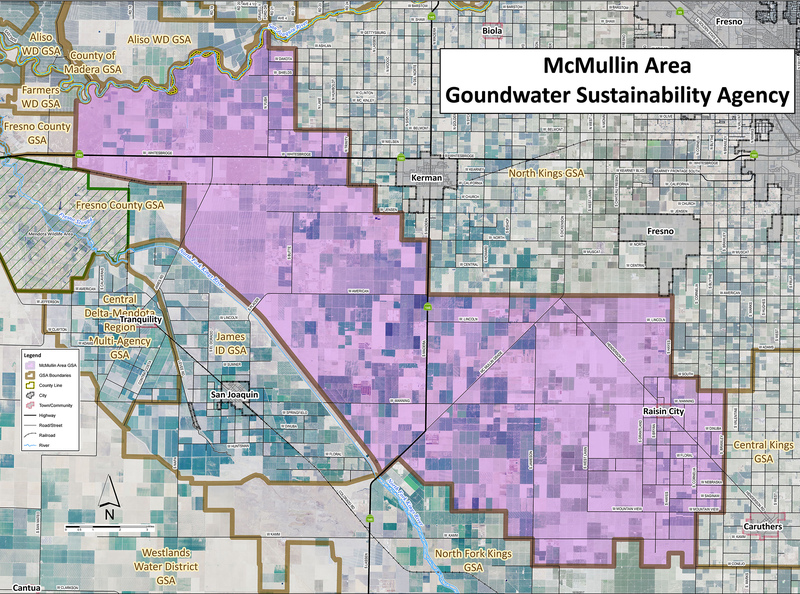 What is the McMullin Area Groundwater Sustainability Agency? The Sustainable Groundwater Management Act (SGMA) is a State law requiring better management and balance of groundwater supplies. The law requires groundwater subbasins be sustainable by the year 2040 through the creation of local Groundwater Sustainability Agencies (GSAs). In response to this law, the McMullin Area GSA was formed in 2017 by Fresno County, Raisin City Water District, and Mid-Valley Water District. This new agency is responsible for developing and implementing a Groundwater Sustainability Plan (GSP) that will describe localized groundwater issues and identify appropriate solutions. Why did the McMullin Area GSA going through a fee election? MAGSA has developed a planning level budget of approximately $2.175 million in annual expenses for the five-year period spanning fiscal years 2019-2023. The budget covers the cost of agency management, development and implementation of a Groundwater Sustainability Plan, and groundwater monitoring. As an unfunded California law, the costs to comply with the new groundwater law will be borne by local landowners. What are the consequences of a failed election? Failure to form a GSA or adequately manage the groundwater basin may subject the GSA to intervention by the State Water Resources Control Board. If MAGSA is unable to raise funds to develop and implement an adequate GSP, the State could designate the basin as probationary and intervene to directly manage groundwater extractions and impose fees to recoup its costs of intervention. The State may impose fees within the GSA ranging from $41/acre to $195/acre with no guarantee of new or supplemental water supplies. By forming the GSA, collecting fees, and funding GSP activities, MAGSA will provide landowners with a more affordable option for managing the basin. What was the result of the election? The McMullin Area GSA successfully passed a Proposition 218 Election and adopted a $19/acre property-related fee in accordance with Water Code section 10730(c). What is the fee amount? The McMullin Area GSA Board has adopted a maximum rate level of $19.00 per acre for all parcels that are larger than two acres within the territory of the GSA. The Board will review the financial need annually and set an fee accordingly up to the $19.00 per acre maximum. How will the fee be collected? The $19/acre fee will be included on your Fresno County tax bill beginning fall 2018. How was the fee determined? The law requires that fees charged to each customer be proportional to the cost of service attributable to that customer. The fee is the result of a detailed budget analysis and an independent professional Fee Study Report. The fee was calculated from MAGSA’s 5-year budget. The budget was based on estimated costs to administer and develop the GSP, as provided by the McMullin Area’s engineer. The cost of service is divided by the lands within the GSA to calculate a $/acre fee. When will the fee take effect? The charges will commence July 2018. The charge will be included on your Fresno County tax bill beginning fall 2018. The fee reflects MAGSA’s fixed cost structure over the next five years. Other funding sources may be obtained at some time in the future that may reduce the fee. The Board must conduct another election if a future higher fee rate is deemed necessary or to impose a new fee beyond the 5-year life of the fee. The budget was developed to account for GSA administration, staffing a General Manager position, developing and implementing the Groundwater Sustainability Plan, and monitoring groundwater levels. A fifteen percent contingency factor was added to all cost categories. How is the agency's Board accountable to the public regarding expenditures? The Board adopts an annual budget, reviews and authorizes payment of expenses at regular public meetings. How does the agency control costs? The McMullin Area GSA Board has minimized expenses where it can by using member agency staff, assistance from community volunteers, and reducing the use of consultants wherever possible. They are also cooperating with related local efforts, like the Irrigated Lands Program, to establish joint monitoring programs. What are the other GSAs in our area doing to raise funds? There are seven GSAs including the McMullin Area GSA in the Kings Subbasin. Most GSAs have conducted similar fee elections. Can revenue be generated through other means? The McMullin Area GSA has and will continue to apply for grants to support its work. In addition to a landowner fee, groundwater extraction fees or other revenue generating measures may be considered in the future but are not authorized by this election. Costs for the ratepayers could potentially be reduced through grant funding. MAGSA was recently approved for a $214,000 grant from the California Department of Water Resources for development of the Groundwater Sustainability Plan.